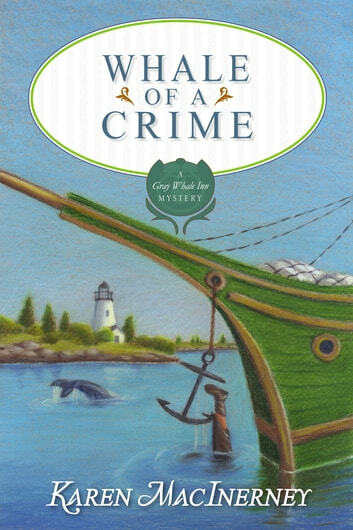 When a tour company books the Gray Whale Inn for a full week, innkeeper Natalie Barnes can’t wait to get cooking — and to hitch a ride on the antique schooner Summer Breeze, getting up close and personal with the local whales. But when one of the humpback whales turns up dragging a mass of fishing gear from its tail, the tour takes a dark turn. It turns darker still when the schooner’s handsome captain winds up attached to the vessel’s anchor, sixty feet underwater… and not by accident. Before long, the tour naturalist (and Natalie’s best friend’s beau) is behind bars, charged with a murder Charlene swears he didn’t commit. Stir in a surprise visit from Natalie’s quarrelsome sister, midnight kitchen sabotage, a sick orphan kitten, and a mysterious investor with plans for a massive resort on the quaint island, and Natalie’s got a recipe for potential disaster. When a second body turns up just outside the inn, the heat is on Natalie to solve the double murder… or risk ending up with her own goose cooked.